Last week, I visited Tennessee’s Knoxville National Cemetery and shared the story of the Union Soldiers Tower. Next door is Old Gray Cemetery which is a little older and a bit bigger than KNC. 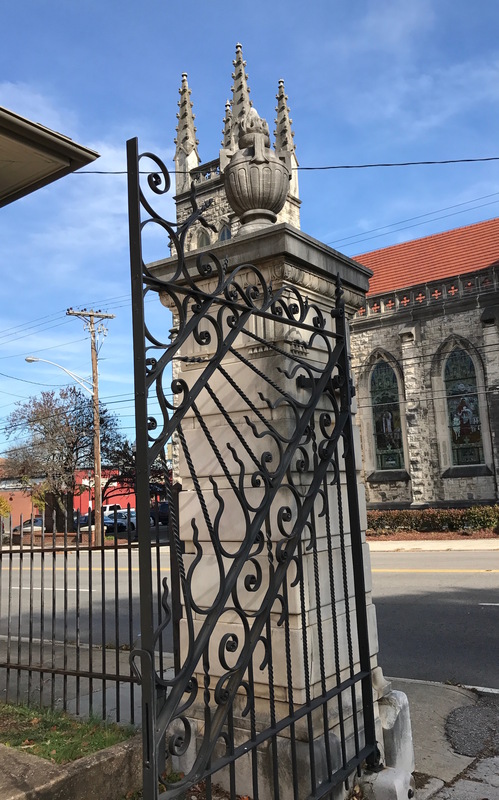 One of the gates at Old Gray Cemetery. Across the street is St. John’s Lutheran Church. 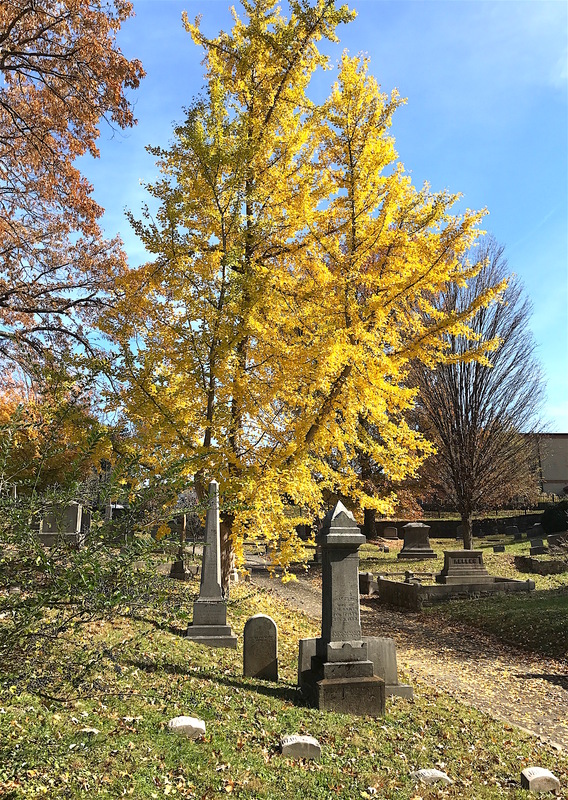 Once used as pastureland just outside Knoxville’s city limits, the land that became Old Gray Cemetery was considered ideal for a suburban cemetery. The first parcel was purchased in December 1849, and landscape architect Frederick Douglass was hired to come up with a ground plan. 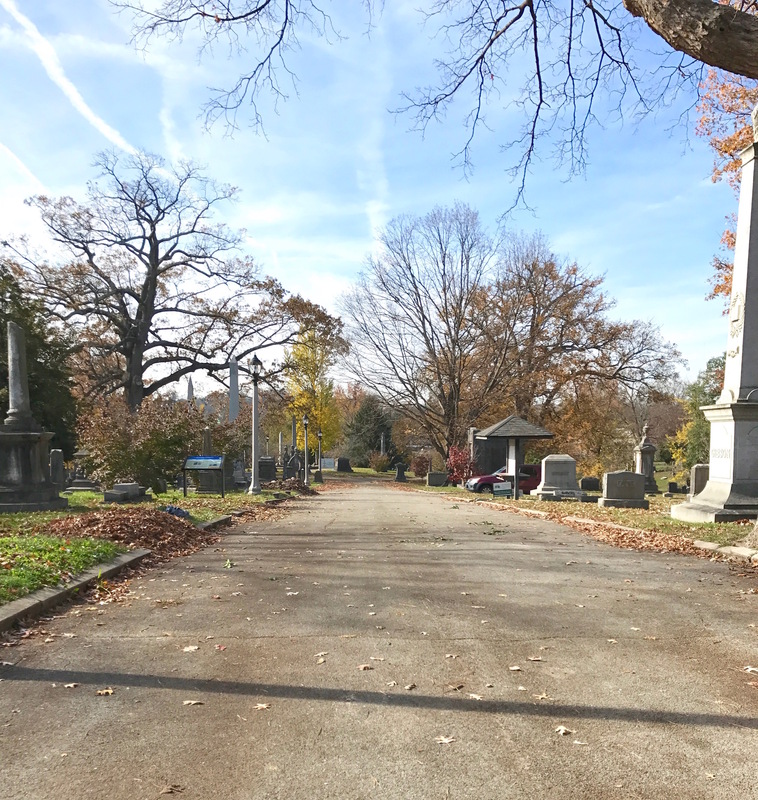 Founded in 1850 and dedicated in 1852, it was called Gray Cemetery until 1892 when New Gray Cemetery opened about a mile away. Old Gray now covers almost 14 acres. Old Gray Cemetery got its name from Thomas Gray (1716-1771), the English poet who wrote the poem “Elegy Written in a Country Churchyard” in 1750. It was suggested by Henrietta Brown Reese, wife of Judge William B. Reese. He was Old Gray’s first board of trustees president. Historical marker at Old Gray Cemetery, founded in 1850. It’s the second oldest cemetery in Knoxville. 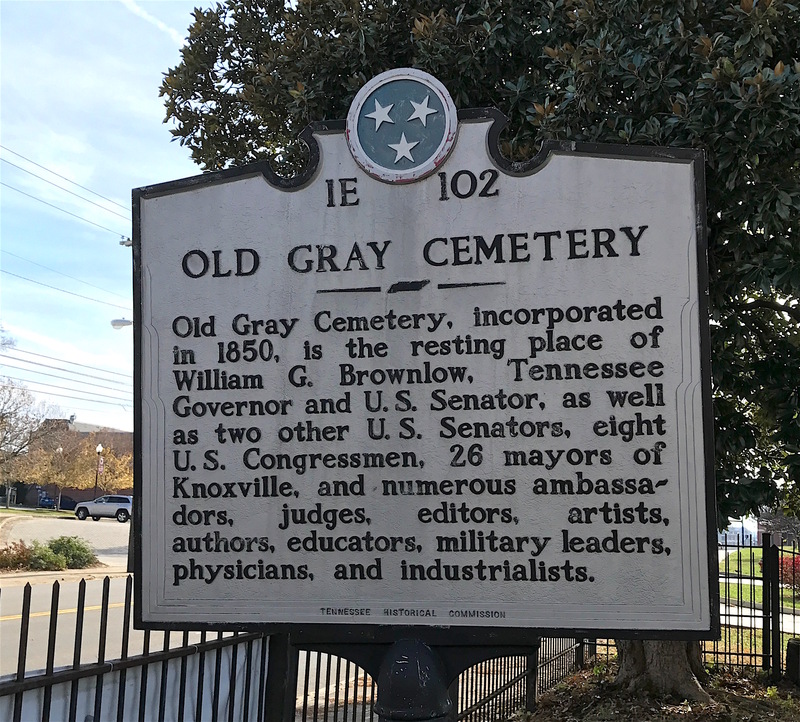 Many of Old Gray’s first burials were victims of Knoxville’s 1854 cholera epidemic. The cemetery also contains several victims of the New Market train wreck of 1904. The tragedy occurred when two Southern Railway passenger trains collided head on near New Market, Tenn. on Sat., Sept. 24, 1904, killing at least 56 passengers and crew and injuring 106. The area around Old Gray (and KNC) is home to a large homeless population, many of whom come to the Salvation Army Center nearby. A number were living under the Broadway overpass in 2017 but a 2018 article detailed the city’s plan to turn that area into a “day park” for the homeless so that may have changed things. Road into Old Gray Cemetery from front gates. When Sean and I were there, we saw a few homeless men quietly eating their lunch in the cemetery. Elsewhere, some college students were sunning themselves on blankets, enjoying the unusually warm weather for November and what was left of the colorful autumn leaves. One of the first graves inside the cemetery gates is a slab gravestone for the Rev. Thomas William Humes, first president of the University of Tennessee (under that name). First known as Blount College, it opened in 1794 with the Rev. Samuel Carrick as president. Humes graduated from East Tennessee College (what the University of Tennessee was called at that time) in 1831, and obtained his master’s degree there two years later. He entered Princeton Theological Seminary to become a Presbyterian minister, but left after deciding he could not take the Westminster Confession of Faith. During the late 1830s and early 1840s, Thomas William Humes worked as editor of the Knoxville Times, the Knoxville Register, and a Whig Party paper, The Watch Tower. Back in Knoxville in the mid-1840s, Humes studied under Tennessee’s Episcopal Bishop James Otey. 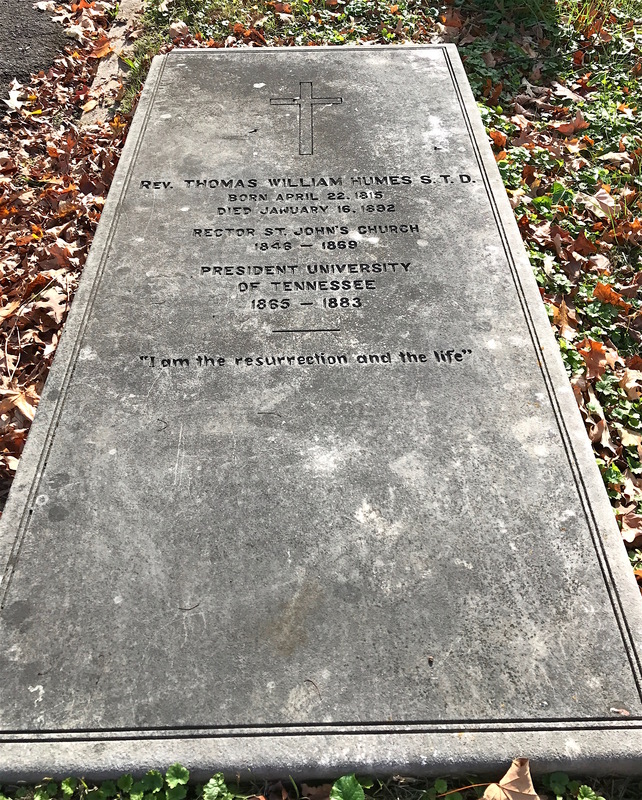 In July 1845, Humes was ordained a priest by Bishop Otey, and in September 1846, Knoxville’s St. John’s Episcopal Church congregation elected him rector. Although Rev. Humes had owned slaves, he helped several slaves in Knoxville purchase their freedom during the late 1840s and 1850s. He also opened a school for Knoxville’s free blacks and freed slaves. During the secession crisis of 1860 and 1861, Humes stayed loyal to the Union, despite the fact many relatives and most of his congregation supported secession. After he refused to acknowledge Confederate president Jefferson Davis’s National Day of Prayer in 1861, Rev. Humes resigned as rector. In 1865, Rev. Humes became president of then-East Tennessee University and secured an $18,500 federal grant to help restore the school’s deteriorated campus, occupied by both Union and Confederate armies during the war. In 1869, Tennessee’s state government designated the school the recipient of the state’s Morrill Act (land grant) funds. This amounted to $400,000, which generated for the school $24,000 in annual interest. The Rev. Thomas William Humes was president of East Tennessee University, which became the University of Tennessee in 1879. In 1879, East Tennessee University changed its name a final time to the University of Tennessee. Rev. Humes resigned as president in 1883, and was succeeded by Charles Dabney in 1884. In later years, Rev. Humes helped raise funds for educational and economic development in East Tennessee. He died on January 16, 1892. Across the drive, you can see monuments and a bench for the Maynard family. Horace Maynard was another East Tennessean loyal to the Union, despite the fact his views seemed to flip flop depending on the times. 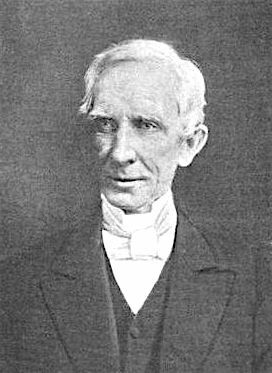 Born in 1814 in Westboro, Mass., Maynard graduated from Amherst College in 1838 and came to East Tennessee College to teach. Maynard also studied law. Admitted to the Bar, he began practicing in 1844. Maynard also involved himself in politics. Unsuccessful in his first bid for national office in 1853, he was elected to the U. S. House of Representatives in 1857. He was re-elected twice and served until Tennessee seceded from the Union. He went on to serve as the Attorney General of Tennessee (1863-1865) and as a delegate to the Southern Loyalist Convention in Philadelphia (1866). 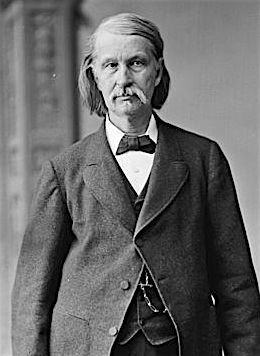 Elected to the House of Representatives from Tennessee’s 2nd Congressional District in 1857, Maynard became one of the few Southern congressmen to maintain his seat in the House during the Civil War. Maynard’s views on slavery reflected shifting sentiments common among East Tennessee Unionists. During the 1830s, Maynard, the son of an abolitionist, called slavery “a curse to the country.” But by 1850, Maynard was defending the practice of slavery in letters to his father. In 1860, Maynard owned four slaves, and while he opposed secession as a congressman, he still defended slavery. Toward the end of the Civil War, Maynard again adopted an abolitionist viewpoint, and supported Lincoln’s Emancipation Proclamation. Horace Maynard successfully defended the creation of Union County, Tenn. from a challenge from Knox County. Grateful residents renamed the Liberty community Maynardsville to show their appreciation. After Tennessee was readmitted to the Union, Maynard was again elected to the U. S. House of Representatives and served until 1875. He then campaigned unsuccessfully for the governorship of Tennessee. President Ulysses S. Grant appointed him U. S. Ambassador to Turkey in 1875, where he remained until May 1880. President Rutherford B. Hayes appointed him Postmaster General in June 1880 and he served until 1881. Horace Maynard died in Knoxville on May 3, 1882. Horace Maynard’s son, James, is buried to his left of his father. Horace Maynard and his wife, Laura Ann, had seven children together. During the Spanish–American War, the USS Nashville, commanded by their son, Washburn, fired the war’s first American shot. Eldest son Edward, who is buried near his parents at Old Gray, has a tragic story worth mentioning. 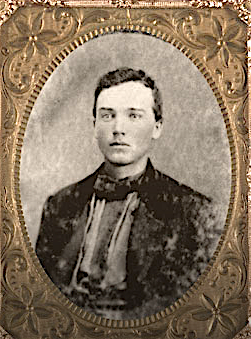 Tintype of Edward Maynard, who survived the Civil War but died in 1868 of yellow fever. Born in Knoxville in 1843, Edward Maynard was attending Eastern Tennessee University when the Civil War broke out. His studies were abruptly curtailed, as he and his fellow students chose up sides and left to enlist. Soon after joining the Union’s 6th Tennessee Volunteer Infantry, Edward was promoted to lieutenant colonel and attached to the 23rd Army Corps. Maynard’s regiment was at the Battle of Murfreesboro, engaged the enemy near Lost Mountain, Ga. in June 1864 and took part in the Battle of Nashville. He escaped unscathed and mustered out in March 1865. After the war, Edward held a minor position in the secretary of state’s office in Nashville. In May 1866, he became consul to the Turks Island, at the time a British-held island north of Cuba and Hispaniola. Unfortunately, his two years in the tropics ended tragically. 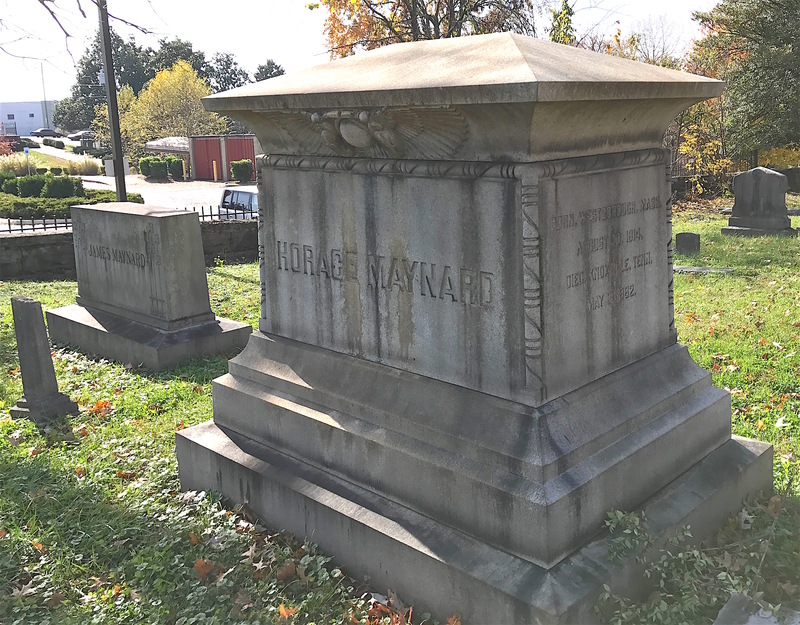 Edward Maynard’s monument is a shortened column, indicating a life cut short. 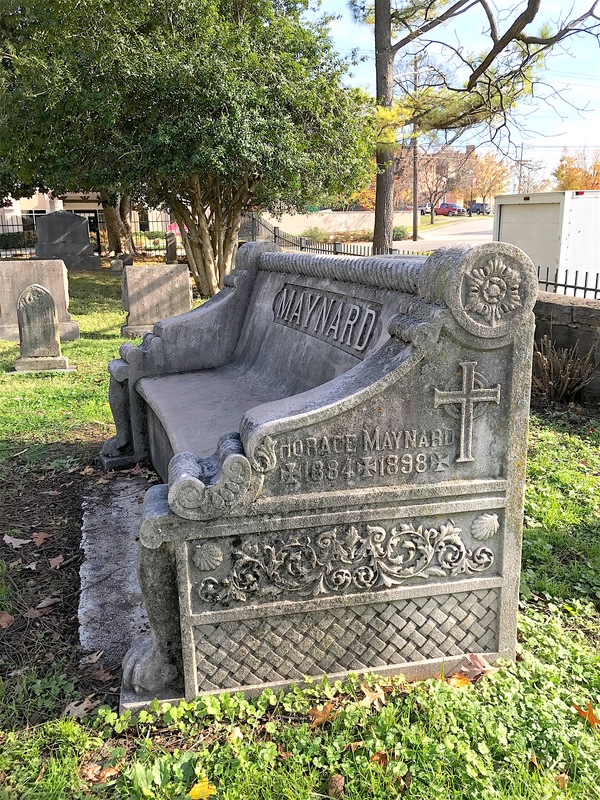 On January 10, 1868, Edward Maynard died of Yellow Fever. His family did not receive news of his death until Feb. 7, 1868. Finally, I’d like to share the story of a monument that I saw from some distance and made certain I got a look at soon after we arrived. Born in Savannah in 1868, Lillien Gaines was the daughter of Confederate Col. James L. Gaines and Belle Porter Gaines. A native of Knoxville, Col. Gaines was wounded at the Battle of Five Forks and lost his arm in the last days of the Civil War. He was already engaged to Missouri native Belle Porter. According to one account I read, Col. Gaines offered to release her from their engagement due to his “mutilation and poverty” but that she married him anyway. 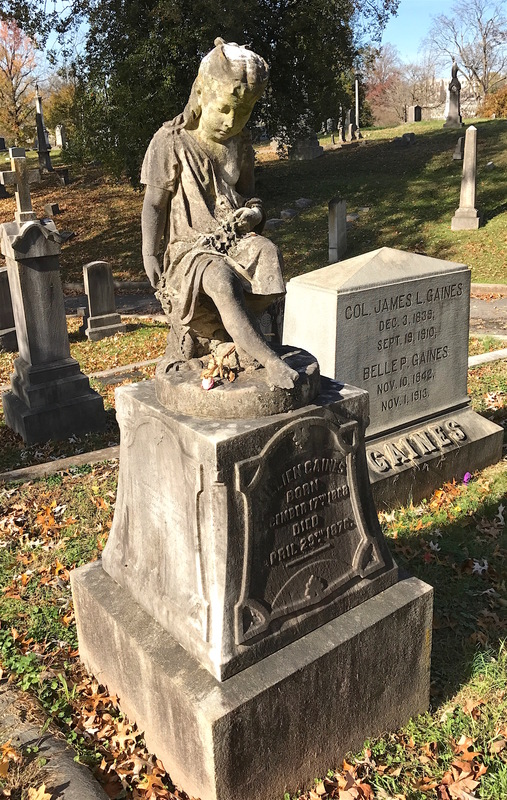 Lillien Gaines was only seven years old when she died in 1876. After marrying on Nov. 22, 1865, Col. Gaines and Belle moved to New York where son Ambrose was born in 1866. They then moved to Savannah, where Lillien was born. They later moved to Knoxville where Col. Gaines was elected comptroller in 1875 and the family moved yet again to Nashville. Lillien spent most of her short life in Knoxville. 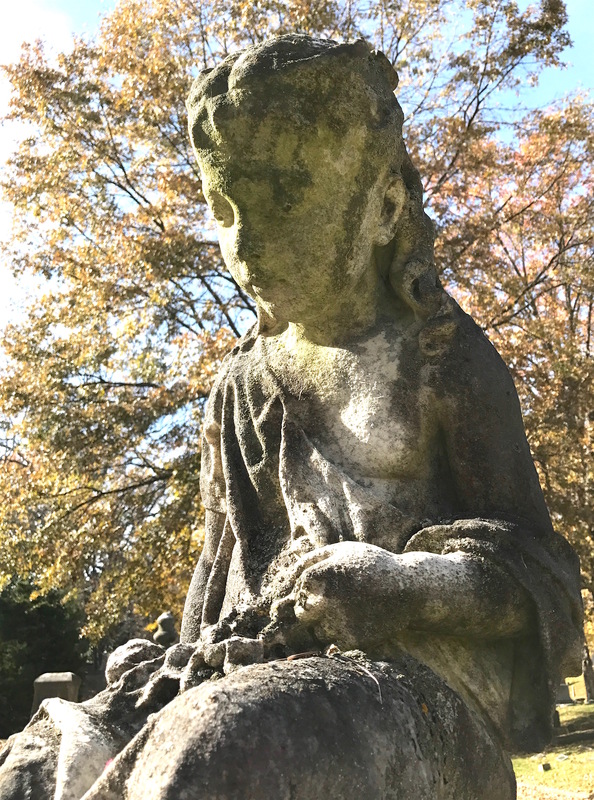 The Gaines’ had only been in Nashville a short time when Lillien became ill. She died on April 29, 1876. While a Memphis newspaper reported she died of meningitis, Tennessee death records indicate she died of “paralysis of the lungs.” Her grieving parents brought her body back to Knoxville, where her father was born and Lillien had spent most of her short life. Col. Gaines and Belle returned to Nashville where they had a third child, James, in 1878. Col. Gaines died in 1910 and Belle died in 1913. Both of them are buried next to Lillien. There are many stories yet to share from Old Gray Cemetery in Part II.